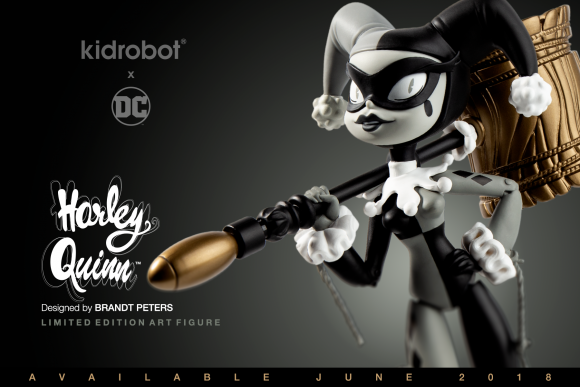 From the mind of Brandt Peters (who brought you The 13 Dunny Series as well as about a thousand other figures in his career) comes a completely new take on everyone’s favorite doctor from Arkham Asylum, Harley Quinn. 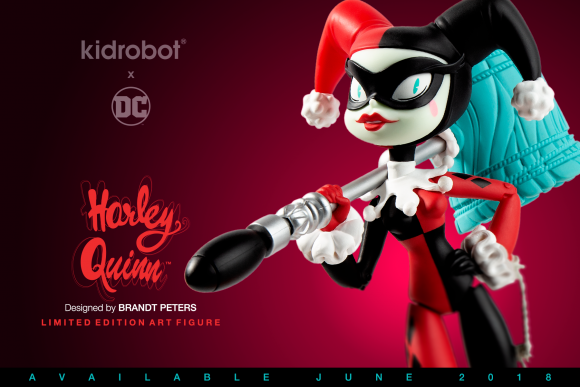 He has teamed up with Kidrobot to continue to push the boundaries of the DC Comics characters you know and love and present them in a way you’ve never seen before. Brandt started his journey with Miss Quinn when he was asked to contribute to her Holiday Special comic, forever infusing his signature style with the Joker’s paramour. Now she makes the leap from the page to vinyl in a super stylized figure. Armed with her trusty mallet and standing on a base made from the liberated controls of a marionette, Gotham’s it girl is ready to bring a heavy dose of chaos into your collection. Available in both full color and super limited Kidrobot.com exclusive greyscale (limited to 200 pieces world-wide), she is available now at www.kidrobot.com.